Being the Waikato’s ADRAD Agent we have over 300 quality new radiators and heater radiators in stock, right here in Hamilton. If we don’t have what you need, we can probably source it from one of the 7 other warehouses spread across New Zealand. 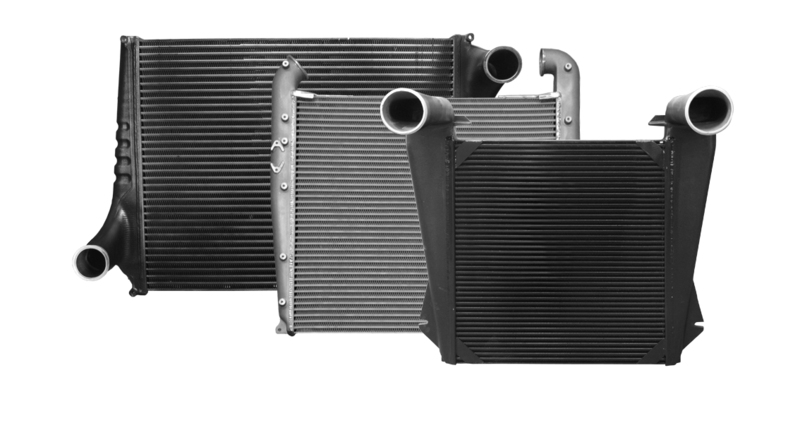 Not all radiators are the same and some aftermarket units are manufactured with poor quality materials and may not fit properly, cool your expensive engine as they should or even fail drastically causing extensive engine damage and your vehicles to be off the road for a long and expensive inconvenience to you. By insisting on a quality ADRAD Radiator from Monteith and Parker you will get a two year warranty and the confidence that your new radiator is a quality unit, factory backed by ADRAD and a group of radiator experts from the top of the North Island to the bottom of the South. In many cases you might not need a new radiator and servicing or repairing your existing unit may be a more economical option. At Monteith and Parker we don’t just sell radiators, we are enthusiasts like you. Between Chris and Eion we have over 60 years experience in resolving cooling system issues for all types of specialist vehicles. With Chris racing Super Stocks for 10 years and Eion being very involved in the muscle car and hotrod scene there isn’t much we haven’t seen or repaired. Lately we have reconditioned and fitted a 1939 Packard radiator, built a custom alloy radiator and supplied electric fans for a Class 3 Off-road buggy, built numerous Super Stock and Standard Stock radiators in both alloy and brass, reconditioned a 1966 302 mustang radiator, re-built a Morris Minor heater and the list goes on. We had one client with a Model A Ford Hotrod who could not keep it cool at low speed. He had consulted quite a few different businesses but no one had been able to resolve his problem. We assessed his complete cooling system and found that the electric fan he was running did not have the airflow to keep his engine cool. We then recommended one of our High Performance Maradyne fans to him which was exactly the same size as his original; this was the only change to the vehicle. To his amazement the vehicle has stayed cool in the worst of the summer’s heat and he has been able to truly enjoy driving this car for the first time since building it more than two years previously. We are truly passionate about your pride and joy and nothing makes us happier than seeing a customer’s classic car or race car winning awards or races or just being out there and enjoyed without having to worry about overheating problems. If you vehicle is overheating, one of the common causes is a blocked or leaking radiator. 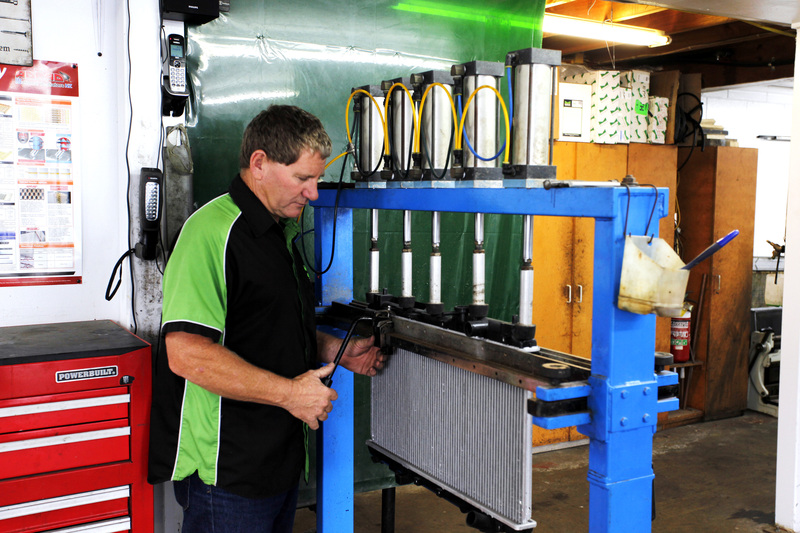 Monteith and Parker have been servicing and repairing copper and brass radiators since 1923 and there are very few companies – if any – with our expertise in automotive cooling systems in New Zealand today. Whether it be a small stone strike leak or a complete tear down and service of your radiator, we can do it all right here in our well-equipped workshop in Hamilton. 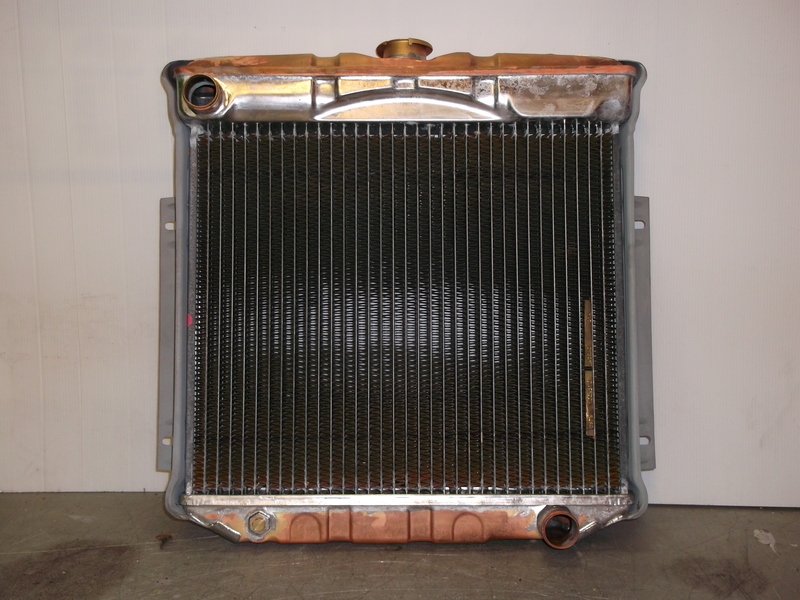 Over time corrosion and contamination can cause your radiator and heater radiator to become blocked causing a restriction in the flow of coolant through them, causing your vehicle to run hot. The best solution is regular proper cooling system flushes and coolant changes to prevent this problem. But if your radiator has become blocked, the only way to properly fix this problem is to physically dismantle and clean each individual tube. There is no product on the market today that can penetrate completely blocked tubes and clean the contamination out. If your radiator is beyond repair or servicing, we can re-core it for your, replace it with a brand new quality ADRAD radiator or custom build a complete new unit for any application you have. In the early 1980’s car manufacturers started using plastic tanks instead of brass on automotive radiators. Partially as this cut down on the use of lead in the construction of the units and also as a cost saving exercise. By the mid 1990’s almost all cars and light commercial vehicles had these fitted and a lot of radiator repairers left the trade as they couldn’t cope with this new technology. However we at Monteith and Parker embraced this new technology and moved with the times. Today we have over 400 new tanks in stock in Hamilton alone. The most common fault with modern plastic tanked radiators is the inlet tank cracking due to thermal deterioration. If your top tank has failed, in most cases we can remove it from the radiator, clean your radiator inside and out, put a brand new tank into it and test the unit to make sure it will give you many more years of service. We have had specialized equipment to do this work and have done since the late 1980’s. Beware of just replacing your original radiator with a cheap aftermarket unit as some poorly made radiators may not even last a year before failing. 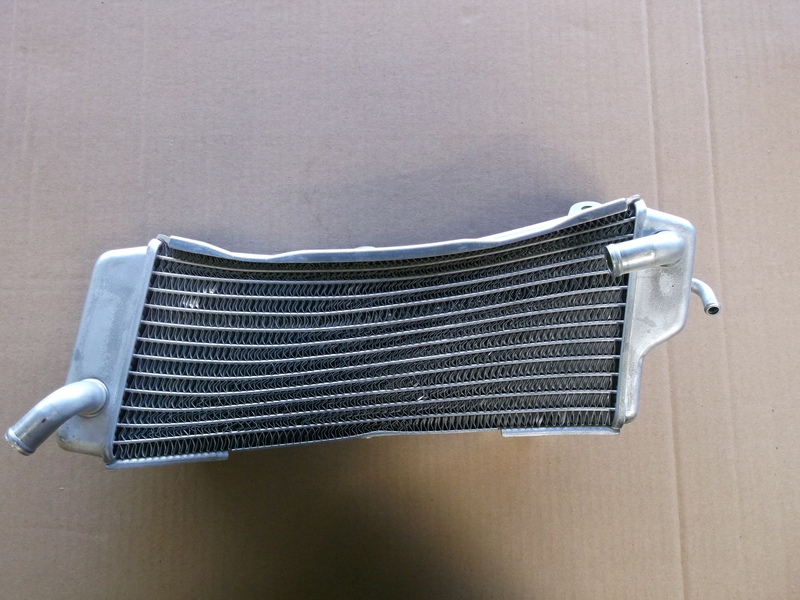 If your existing radiator is beyond repair we can supply you with a quality ADRAD radiator that will go the distance. At Monteith and Parker we specialize in servicing, straightening and repairing motorcycle radiators. We always braze most repairs as this is far more reliable than the glues or resins most others use. For harder materials we have our own rig welder in house so we can handle all of your alloy radiator repair work and modification. So if you have had a racing incident, are rebuilding your motorcycles engines or have had a stone strike and your radiator is leaking, come see us as you would not believe what we can repair to get your bike up and running again. Repairing your damaged motorcycle radiator is often far more economical than buying a new radiator and usually we can repair for you the same day to keep you riding. Form an old D3 Caterpillar Dozer or Nuffield tractor to the latest M.A.N Bus or Eimco mine crawler we can service, repair or rebuild most industrial radiators. Being the central North Islands ADRHD Radiators Agent we have access to Air Radiators full range of industrial radiators, cores and intercoolers. Air radiators have suppled original equipment cooling components to Mack, Cat and Kenworth in Australia to name just a few companies, so you can be assured at the quality and performance of the units we supply to protect your livelihood. Whether your Kenworth Radiator is blocked and needs cleaning or your stationery engines radiator is leaking we can repair and service it right here in Hamilton for you and having been repairing radiators at Monteith and Parker since 1923, you can be assured of the quality, expertise and service you will receive. Almost all turbocharged engines whether petrol or diesel nowadays use an intercooler to cool the air that is fed into the engine increasing performance and fuel efficiency. If the intercooler becomes blocked or starts to leak, your engine will not perform as intended and will lose power and economy. At Monteith and Parker we can service, repair or supply new intercoolers to suit any application you have, whether it is the latest Evo track or the largest agriculture Harvester. 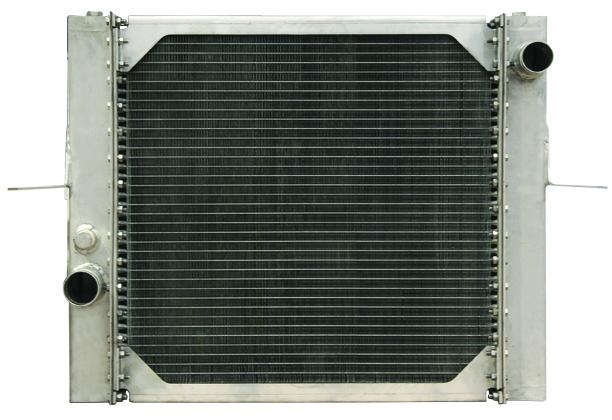 We have developed a specialized flushing process to remove oil and carbon build up internally from your intercooler. If you have had a turbocharge fail or your charge air system has oil or carbon build up CONTACT US to see how we can get your vehicle or machinery performing as it should. At Monteith and Parker we can clean repair and service most automotive, agricultural, commercial and industrial engine oil coolers, transmission oil coolers and hydraulic oil coolers. We can also supply these parts new. If your vehicle was constructed after 1960 there are pretty good odds it is fitted with a heater. The heater radiator is constructed the same as a normal radiator from copper, brass, plastic and alloy or a complete alloy unit. The coolant from your engine flows through the heater and the warmth from this is transferred to the interior of your vehicles to warm your car. 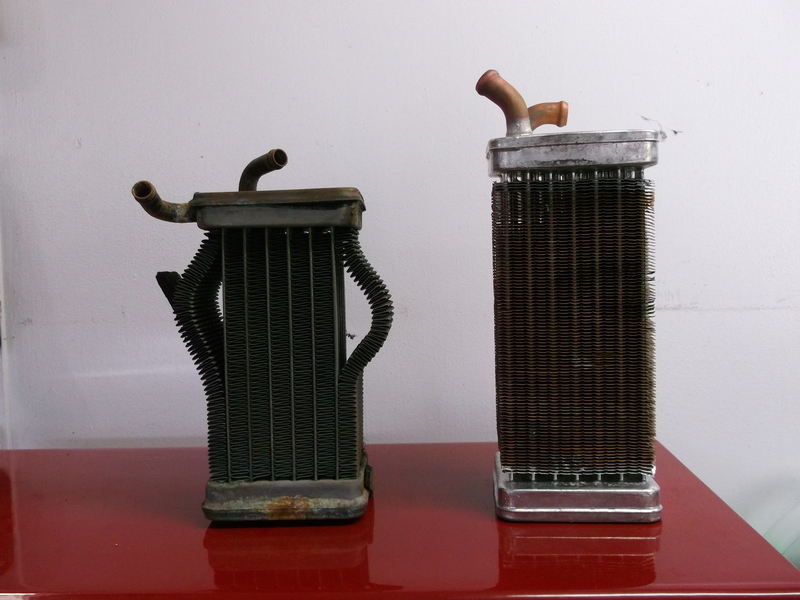 Heater radiators suffer from the same issues as your engine radiator and over time can become blocked and corrode and leak. If your heater isn’t as hot as it should be, you find the floor is wet or your windscreen is constantly fogging up and you are losing coolant but can’t find a leak, it may be the heater radiator. At Monteith and Parker we have over half a decades experience in solving these issues. 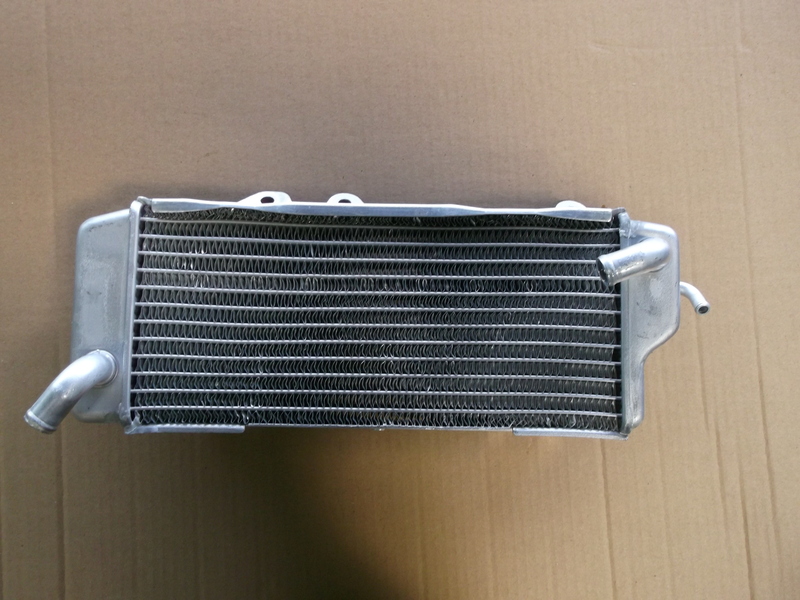 We can repair, rebuild and service all automotive heater radiators. If we cannot repair the radiator, we can supply a new unit. We specialize in building new heater radiators from scratch. If you have an issue with the heater in your vehicle contact us for friendly free advice or a no obligation quote. If your vehicle gets hot at idle or low speeds but cools perfectly on the open road then there is a good chance the radiator cooling fan is not operating properly or just not up to the task. This is especially true when it comes to modified or high performance vehicles or ones that have had an engine conversion. 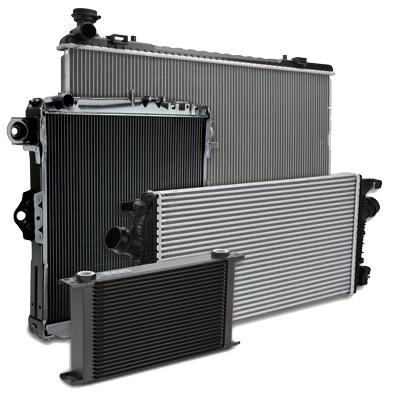 At low speeds good airflow through your vehicles radiator is critical to keeping engine temperatures down. 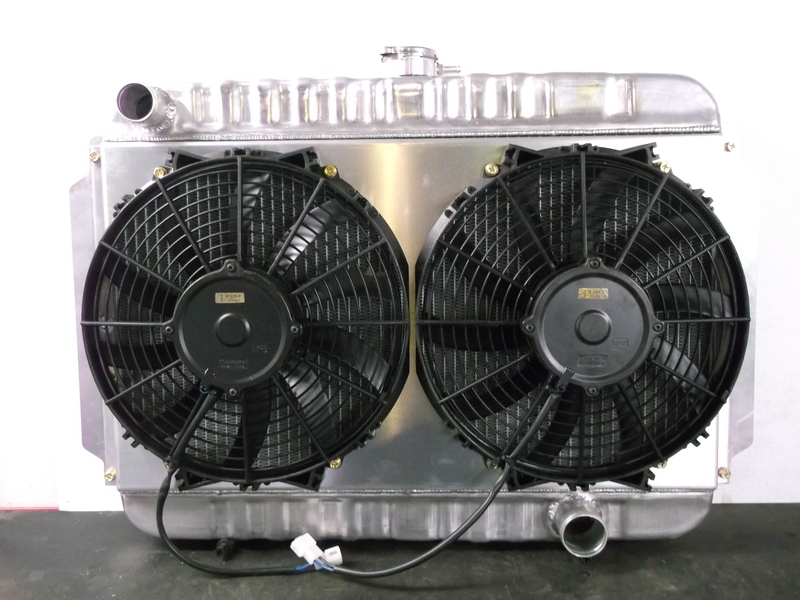 Here at Monteith and Parker Chris and Eion have over 60 years combined experience with all sorts of modified vehicles and their cooling systems. We have seen many different types of electric fans over the years and we regularly have clients coming to us with fans they have fitted that have very poor airflow. We had one client recently who was sold a 12 inch fan as the best unit around when in reality it only had 600 cubic feet per minute (CFM) of airflow causing his vehicle to constantly overheat at low speeds. The Maradyne High Performance Electric Fan we recommended to him was the exact same diameter but had 1595 CFM and instantly solved all of his low speed cooling issues. Maradyne is an American company and they specialise in High Performance/High Quality Electric fans for automotive cooling systems. With sizes ranging from 9 to 16 inches and airflow ratings from 790 to 2170 CFM we should be able to supply you with the right fan first time for any application you have. We currently hold these sizes of Quality 12 Volt Maradyne fans in stock – 12” 1155CFM, 12” 1595 CFM, 14” 1555 CFM, 14” 2135 CFM and 16” 2170 CFM. Please contact us for more details. If you don’t see what you need here we should be able to source the right part for your application so give us a call for free friendly advice. Click here to see the Maradyne Difference! Have you had an engine or transmission cooler fail and pump oil into your cooling system? We carry in stock a specialized cooling system de-oiler that actually works without damaging the gaskets or seals in your cooling system. Our radiator de-oiler breaks down the oily sludge in the cooling system enabling you to flush it out and stop continued overheating problems and that oily film in the system. This product does what it says it does!!! We carry a large range of radiator caps, hose clamps, water blanking caps, electrical and mechanical fans and thermo fan switches. In fact anything you may need for your cooling system repairs. Just ask us and if we don’t have it we can probably source it for you. 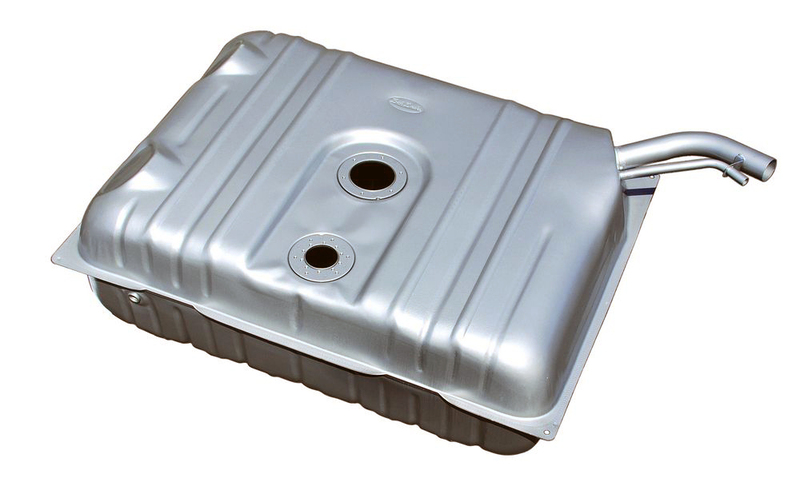 Over years of use, fuel tanks can become contaminated with moisture from poor quality fuel and the atmosphere. Often when this happens they can rust internally causing particles to get into the fuel system blocking the carburetor jets, fuel filters and fuel injectors causing your engine to run rough and lack power. At Monteith and Parker we can chemically clean, repair leaks and line your fuel tank to stop these problems and prevent rust and contamination occurring again. If you are upgrading your engine for more power and need a better fuel supply we can often modify and install a larger diameter fuel pickup to cater for the increased demand for fuel. CONTACT US TODAY to see how we can help you ensure your fuel system has the clean and constant supply of fuel that it needs.